The coast redwood, also called the California redwood, is the tallest living thing in the world. It also grows to great volume. One grove of trees in Humboldt Redwoods State park contains the largest measured concentration of living material, or biomass, in the world. The current natural range of the coast redwood is confined to a coastal strip about 450 miles long from the southwest corner of Oregon to southern Monterey county. This strip is 5 to 35 miles wide and covers approximately 2.2 million acres. Old growth redwoods occupy about 200,000 acres, most of which is in state and national parks. About 600,000 acres of coast redwood habitat are in commercial timber production. Needles are one-half to three-quarters of an inch long with sharp ends, shaped like a double-edged sword, and occur in a flat plane forming feathery sprays. Cones are about an inch long, hard and woody, made up of thick, wrinkled scales. Bark is reddish-brown, thick, rough, and deeply furrowed and up to two feet thick. Coast redwood can be found at elevations ranging from sea level to 3,000 feet. It is typically found at elevations ranging from 100 - 2,300 feet. Through the northern parts of its range coast redwood can be found on all slopes, in the southern portion of its range it can be found on western and northern slopes. In the extreme southern portion of its range coast redwood is found in narrow canyons bottoms near ocean. The coast redwood grows in a very humid region along the Pacific ocean. This incredibly productive environment delivers substantial rainfall in the fall, winter and spring. Temperatures are moderate year round, with mild wet winters, and dry summers. The redwood's range seems to be determined more by the distribution of summer fog than the actual amount of rainfall. Fog actually condenses on tree crowns and drips down to water the roots of the tree during the dry summer months. The humidity of fog also decreases trees' water loss from evaporation and transpiration. Redwoods can even generate their own fog, from the up to 500 gallons of water a large tree may transpire into the air per day. Redwood located beyond the fog belt is limited to moist sites. Despite its reliance on fog in its natural range, redwoods have been grown very successfully far from the coast in plantations and as ornamentals in the Central Valley, at low elevations in the Sierra Nevada, and in Europe and New Zealand. Climate in the coast redwood's natural range is moderate with precipitation ranging 25-122 inches annually, mostly as winter rain, but with a large degree of fog drip. Temperatures average 50 - 60° degrees Fahrenheit with the minimum being 10° on the coast and 30° on the eastern edge. Redwoods grow mostly on soils derived from sandstone which formed under the ocean floor thousands of years ago. It is also found on soils formed from limestone, slate, chert, and schist. Redwood is not found growing on soils which have high amounts of magnesium and sodium. The redwood region is rugged and mountainous with ridges which are cut by deep narrow valleys. Much of the terrain is steep and contains many streams. The best stands are found in deep soils on benches along large streams, on moist coastal plains, river deltas, and valleys facing the ocean. On flat ground near streams redwood reach its maximum growth rates and size. Redwood growth depends on the soil moisture available during the course of the year. Redwoods grow when minimum soil moisture ranges from 18 to 86%, but they grow best when soil moisture does not go below 60 %. Redwood has no taproot but its roots spread out over large areas. Although many redwood stands are close to the sea, they do not seem to tolerate ocean winds or salts and so do not grow on exposed hillsides that face the ocean. Redwood trees grow smaller in size and are replaced by other tree species as altitude, dryness, and slope increase. Coast redwoods regenerate by seed, stump sprouting, and artificial cuttings. Redwoods start to bear seeds when trees are 5 to 15 years old, although seed viability increases as trees get older. Seeds are shed after cones open in the fall. Seeds are small and light and fall up to 200 feet uphill and 400 feet downhill under average conditions. Germination rates are typically low. Seeds germinate best on mineral soil, but also on litter, logs, or debris, in shade or full sun if there is enough soil moisture. 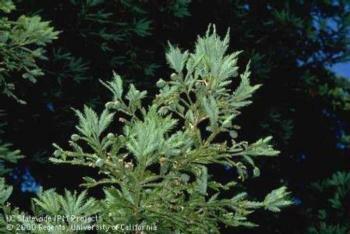 Redwood seedlings require greater soil moisture than most associated trees because they do not have root hairs. Redwood seedlings are also very vulnerable to infection by damping off fungi (Botrytis) during their first year. The coast redwood is a prodigious sprouter. It can sprout from stumps and root crowns within 2 to 3 weeks of being cut. Over a hundred sprouts may arise from the stump of one cut tree. Sprouts develop their own root system and create circles of new trees around old stumps. These new trees are all genetic clones of the original tree and may have interconnected root systems which helps their stability. Sprouts grow more quickly than seedlings, sometimes achieving heights of seven feet in a single growing season. Sprouting capacity decreases with size and age. Redwood grows in nearly pure stands as well as interspersed with other conifers and hardwoods. Pure stands of redwood are found only on the best sites; moist flat ground along rivers with gentle slope below 1,000 feet in elevation. Redwood predominate in these locations because it is better adapted to flooding than other trees. Repeated flooding builds up the soil level at the base of trees. Redwood adapts by putting out new roots higher up in the soil while other trees are killed. Coast redwood usually dominates when growing with other trees. Redwoods grow very quickly in full sunlight, often 18 inches in the first year, and 2 to 6 feet a year for the first 10 years. It can also grow faster than associated species in deep shade. Redwood is often found growing with Douglas-fir which can grow as quickly as redwood on many sites. Other associated species include western hemlock, grand fir, and Sitka spruce. On drier slopes tan oak, madrone, maple, and California bay laurel grow along with the conifers. Tan oak and Pacific madrone, like the coast redwood, often resprout when cut, and can reoccupy a site as quickly as redwood. Redwood is shade tolerant, meaning that it can survive at very low light levels. Small trees in the deep shade of the forest floor can survive for many years and then grow vigorously when events around them, such as logging or fire, increase the sunlight they receive. Large trees and dense stocking combine to produce high yields. More than 81 % of commercial redwood land is classified as highly productive. Young redwoods can grow to 100 or 150’ in height in 50 years. In open stands they can grow more than an inch in diameter per year. On industrial land, clearcutting is the preferred silvicultural system. Shelterwood, and selection cut are also used, though both are considered less economical because residual trees may be toppled by wind or damaged during logging, or may not grow well. Redwood's tolerance and ability to sprout allow great latitude in the choice of silvicultural system. Damaging agents include fire, cankers and fungi, and mammals. Although old coast redwood is very resistant to fire damage because of its thick bark, young trees, especially under age 20, may be killed outright. However, the stumps of young trees can quickly resprout and reoccupy a burned site. Other damaging agents are branch canker, and heart rots. Branch canker (Coryneum spp.) girdles stems and branches, and can be especially harmful in plantations. Heart rots including brown cubical rot (Poria sequoiae) and white ring rot (Poria albipellucida) can cause extensive cull. Wood rats girdle and strip the bark of redwood seedlings, and black bears strip bark from young trees. The insects found on redwoods, flatheaded twig borers (Anthaxia aeneogaster), redwood bark beetles (Phloeosinus sequoiae and Phloeosinus cristatus), and the sequoia pitch moth (Vespamima sequoiae) do not cause significant damage. Redwood is named for the color of its bark and heartwood. The high tannin content of the wood gives the trees remarkable resistance to fungus, diseases, and insect infestations, reasons why redwood lumber is so desirable. Redwood is also very resistant to water associated rot, making it a preferred wood for exterior siding, outdoor decks, hot tubs, vats and fences. Redwood burls are also valued as table tops, veneers, bowls, and house plants. The tough and fibrous bark is used as insulation, mulch, and fuel. This text was largely summarized from an article originally by David F. Olson, Jr., Supervisory Research Forester (retired), Douglass F. Roy, Research Forester (deceased), and Gerald A. Walters, Research Forester, USFS Pacific Southwest Forest and Range Experiment Station, Berkeley, CA that appears in Burns, Russell M., and Barbara H. Honkala, tech. coords. 1990. Silvics of North America: 1. Conifers. Agriculture Handbook 654. U.S. Department of Agriculture, Forest Service, Washington, DC. vol. 1, 675 p.
Interested readers are referred to the original article for more detailed and technical information and references. Publication of this series was in part funded by the California Department of Forestry and Fire Protection under Contract numbers 8CA96027 and 8CA96028. Proceedings of coast redwood forests in a changing California: A symposium for scientists and managers. June 21-23, 2011, UC Santa Cruz, CA. Proceedings of the Redwood Region Forest Science Symposium: What Does the Future Hold? March 15-17, 2004, Rohnert Park, CA. Proceedings of Conference on Coast Redwood Forest Ecology and Management, June 18-20, 1996.